Where do I go for Race Meetings? Mallala Motor Sport Park – Mallala is 55km north of Adelaide and 2km north of the Mallala township. Approach from Adelaide via Highway 1 (Pt Wakefield Road), turn right off Highway 1 at Two Wells, and continue on to Mallala and straight through the large intersection in Mallala. Once at the circuit, if the event is a major event (such as CAMS National Series), you may need to collect your pass from the credentials office before passing through the ticket booths. 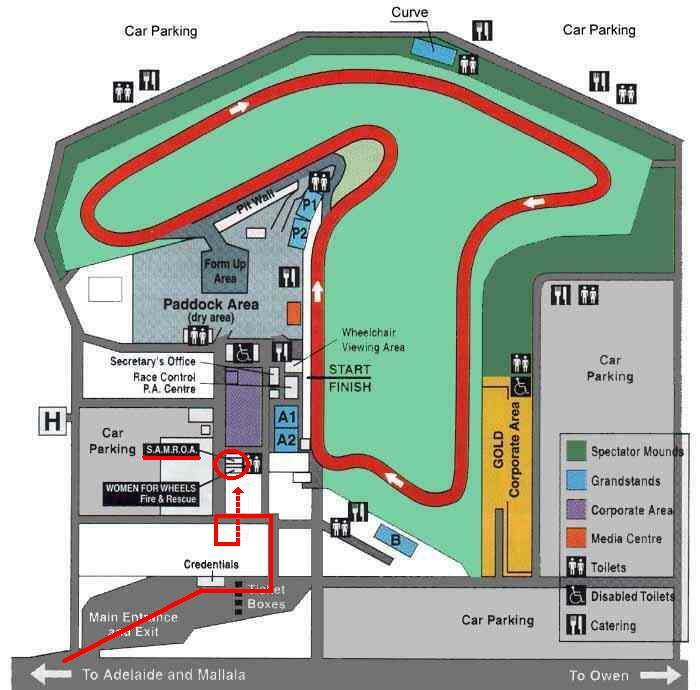 Once you have collected your credentials, or if they are not required, follow the red line on this map to the Officials car park, then walk to the SAMROA shed. Wear suitable clothing for the weather and shouldn’t clash with flag colours (Orange is good), fully enclosed shoes (sneakers are fine), a hat (or beanie on cold days) and some water to drink. It may be a good idea to bring something to eat in case you get hungry before the lunch break (lollies are fine) Try to get a good sleep the night before. Arrive 15 minutes before the briefing starts so we are able to give you a short briefing on the “DOs & DON’Ts”, what your tasks and responsibilities will be during the day and teach you how to wave a flag. How much do officials get paid? Nothing at all. We’re all volunteers and enjoy doing what we do. It is not possible (without driving) to get closer to the action than we do. However, we do not pay any entry fees, and depending on the event we may also get free guest passes, meals, and other freebies, but these are not guaranteed and are greatly appreciated when we do receive them. Where do I go for Monthly Meetings? Club membership is currently $40 per year. Other than a warm fuzzy feeling, you also receive a monthly newsletter, as well as other “extra” such as entitlement to the Reward & Recognition Scheme, training days, discounts to our annual dinner and other various entitlements. I have more questions, is there someone I can ask? To become a member, you will initially be required to attend a minimum of 3 race meetings in a 12 months period. Once you have attended three meetings, you are required to fill out a membership application form (and payment of membership fee) which also needs to be endorsed by a current member, and then handed to our Training and Competition Committee. The Training and Competition Committee will then make a recommendation as to whether to accept the application or not to our General Committee, which then approves or disapproves the application. Assuming you are approved, you will receive a information pack and letter welcoming you to the club. Can I invite friends/family to come with me to a race meeting? If your guest(s) also wish to participate with us, then they can come with you to the shed where all appropriate paperwork will be handled. Remember though that all trackside officials are required to be aged 16 and over, and all officials under the age of 18 require parental consent before they are able to participate. If your guest(s) wish to simply watch the racing, this is not a problem and there are generally plenty of places where this can be done. Just remember though that your guest(s) will not be able to be with you while you are on duty. Also remember that depending on the meeting, your guest(s) may need to pay for a ticket receiving any free tickets is not guaranteed. The under 18 indemnity form can be found HERE (just make sure the bottom part is singed and bring it to Mallala). How close to the racing can I get? You will not be able to get any closer without being a driver. Have a look at some of the photos in our Photo gallery which will give you an idea of how close to the action we are. Like anything in life there are risks, and as the back of all motorsport tickets say, “Motorsport is Dangerous”, however the risks are very low and proactive care is taken to further minimise the risks. The committee has a member who is responsible for OH&S for officials and any concerns can be raised with any committee member . If you are unsure about these risks, our suggestion would be to still come to an event, and if you do not wish to take any further part, just let the senior official know. Is there a required uniform? All SAMROA members are required to wear our club overalls which can be purchased once you become a member. The cost of the overalls are currently $90. More information is available once you become a member. Until you purchase your own overalls, we have some which you can borrow at the shed at Mallala. I have a disability and/or a medical condition, can I still participate? This is a tough one and really depends on the disability and medical condition. While the club does not discriminate, if you are unable to quickly run to avoid being hit by a car or debris, or you are unable to concentrate on a task for an extended period, then you really should not be there as it can be unsafe for both yourself and fellow officials. There are roles at motorsport events that are out of harms way and we can point you in the right direction. Generally medical conditions such as diabetes are not a problem, but please consult your doctor if you are unsure. If you would like to find out whether you are able to be involved or not, please contact our new member contact via email. All trackside officials are required to be 16 years old and over. Also, all officials under the age of 18 are required to have a parental consent form signed by a parent or guardian for EACH meeting. More information can be found on CAMS’ website HERE, and the under 18 indemnity form can be found HERE (just make sure the bottom part is signed).